Spinning was a daily chore just a few generations ago. Today people are finding spinning a wonderful craft and love making yarns for their weaving and knitting. Bring your own wheel and spend a few hours perfecting your skills with two different fibers. 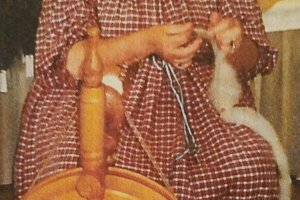 Sat, June 8, 10 am-12 pm will be the class Spinning Flax into Linen and 1 pm-3 pm will be the class Spinning Silk. Each of the classes will cost $40 and includes all supplies other than the wheel, $80 for both classes. Please bring your lunch if you register for both classes. This workshop will be held at the Alling Coverlet Museum, 122 William St., Palmyra. Interested individuals can register online, in-person at the museum office (132 Market St., Palmyra), or by phone (315-597-6981).